An Expectations Multiple off of Guidance, Actual Revenue, or Actual Earnings. The stock is near its 52-week high, and is likely to trade down at a multiple of any guidance or revenue disappointment. So if revenue comes in 1% lower than the expected $197 million, don't be surprised if the stock drops 5-10% after hours and on Tuesday. This has been happening with most data center stocks after they report, with exaggerated price swings down or up based on slight disappointments, or marginally better-than-expected results. From Equinix to DuPont Fabros to Terremark to F5 Networks to Riverbed, few earnings calls have taken place this quarter without being followed by an unjustified emotional response from the stock market. I'm sure some smart trader is taking advantage of this. The year-ago quarter saw the highest sequential increase in managed services revenue the company has had over the last year, providing a high comparison for this quarter's y/y calculation. Year-over-year top line growth last quarter for managed services was 18%, and for all the talk about Cloud, this company is not worth 60x annualized earnings if its growth depends on a service where it's running behind Amazon's EC2, and where it does not have the same cost advantages in leasing and personnel costs that it has in managed services. Managed services competitors have lower asset utilization, higher rent costs, and more costly personnel, largely because they're also offering unmanaged colocation, which adds significantly to space requirements, and because they're hiring in DC, New Jersey, and Silicon Valley, while Rackspace is staffing up in low cost markets like San Antonio and Blacksburg, VA.
Over the last five quarters, Rackspace's SG&A costs have dropped from 39.9% of revenue to 37.4% of revenue, which has been essential to increasing net margins as gross margins have held steady. 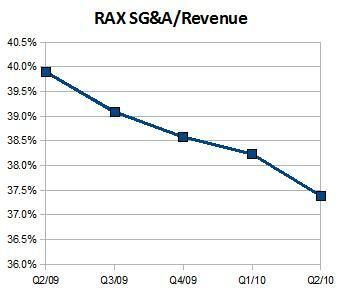 SG&A ratios have dropped because employee productivity has risen from $229,600 of annualized revenue per "Racker", to $249,600 over the same period. While y/y top line growth last quarter was in the low 20s, the company's current valuation of 74x annualized earnings is just above its 60% y/y growth in bottom line profitability. Continued reductions in its SG&A/Revenue ratio are essential to maintaining such a high valuation. Still, watch out for a sharp reaction on Tuesday if top line guidance surprises in any way.